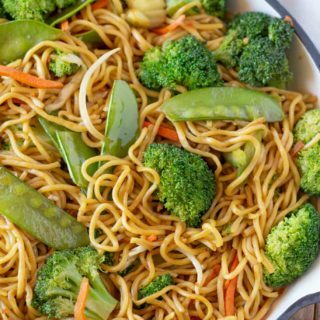 Vegetable Chow Mein made with celery, broccoli, cabbage, carrots, and bean sprouts mixed with chow mein noodles in a savory sauce, ready in under 30 minutes! Heat a large pan or wok on medium heat with the oil add in the cabbage, broccoli, celery and carrots. Add in the pasta, bean sprouts and toss to coat. *Homemade Kecap Manis: Add 1 1/2 teaspoons of soy sauce and 1 1/2 teaspoons of molasses or dark brown sugar with a tiny pinch of ground anise. This is a decent substitute, but if you can get the original the flavor will be even deeper.